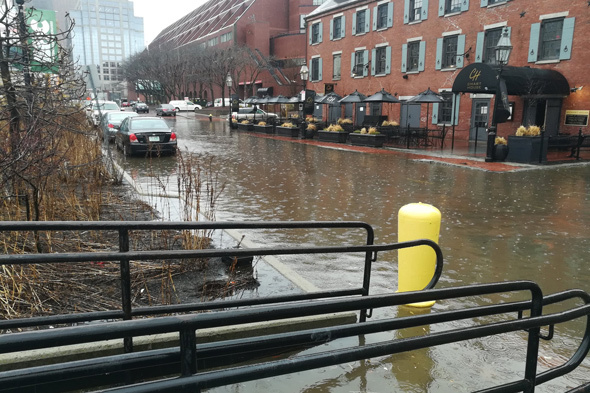 Justin Teman took a walk along Fort Point Channel this morning, at least, the part that wasn't flooded. Read more. 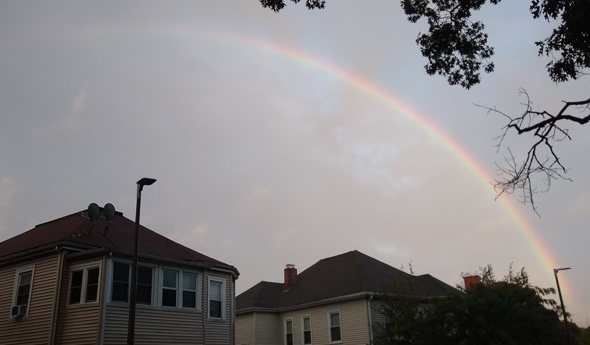 Mark Smith captured the rainbow over Roslindale this afternoon. 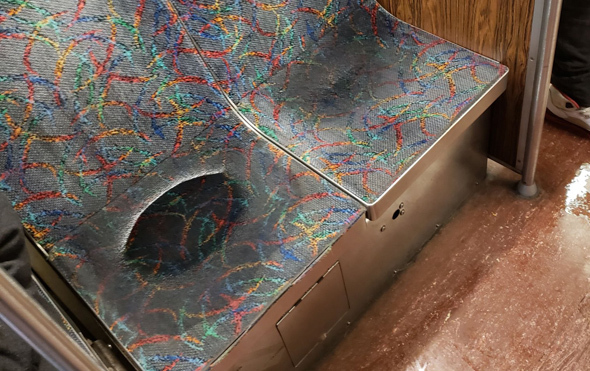 Jamaica Plain got a rainbow as well - looks like the pot o' gold was somewhere on Centre Street: Read more. In fact there's water dripping on me as I type this! 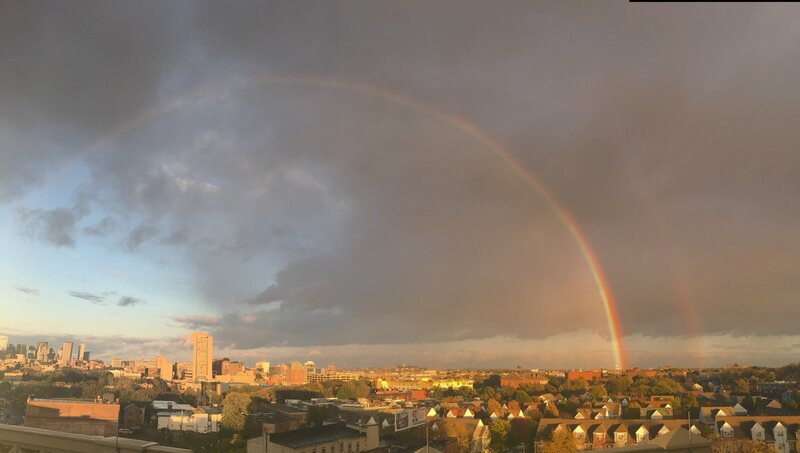 For the second afternoon in a row before a World Series game, Boston's sky was lit up by a double rainbow. Lena was among the many who captured the ribbons of color over the Boston area. Read more. 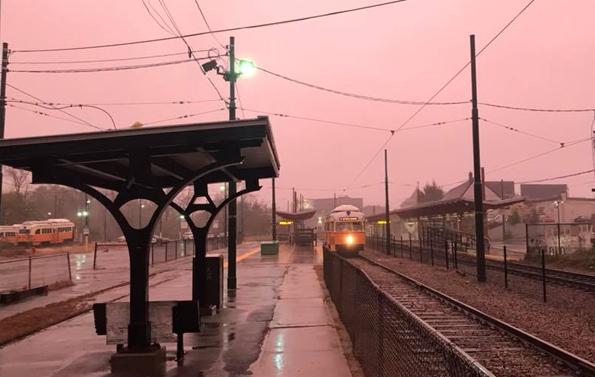 Hannah spotted an omen in Dorchester after the storm line that came through, giving us some thunder and sparking a tornado warning from the Providence suburbs into southern Norfolk County. Rainbow meets Rainbow Swash for day 1 of the Series. 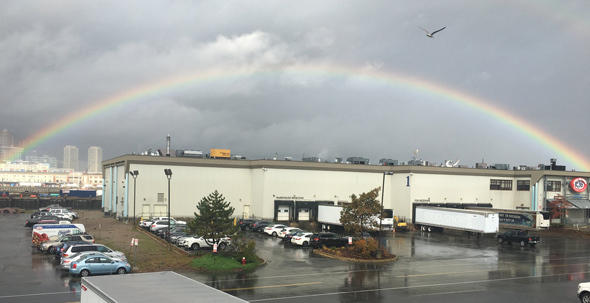 Paul Friedmann captured this morning's rainbow. Mama and the National Weather Service warned us there'd be days like this. 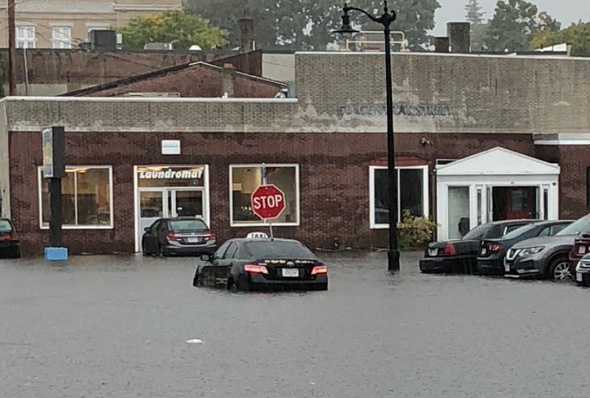 Tony Ursillo shows us some flash flooding in Norwood, of the sort the NWS sent out a warning about. Read more. 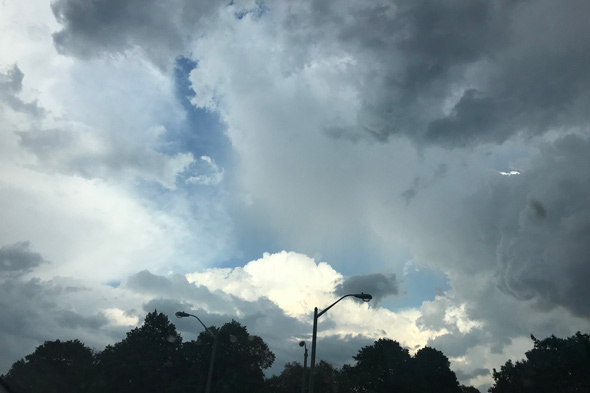 C. Carew looked out the window at Kosciusko Circle in Dorchester around 4:45 p.m., about when the National Weather Service issued a severe thunderstorm warning for Boston. 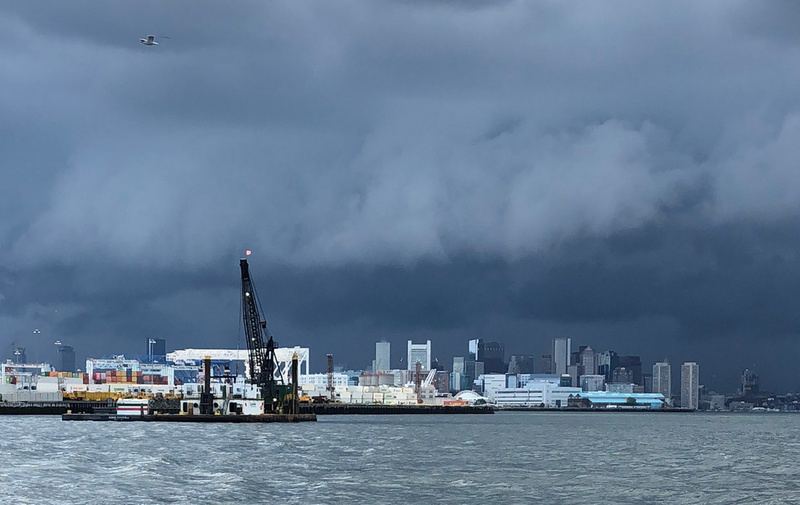 Paula Tennyson watched the rain come down over Kenmore Square and the Fenway around 4 p.m.
Down at Jamaica Pond, this ominous cloud approached quickly - about five minutes after the shot below, a torrential downpour began: Read more. 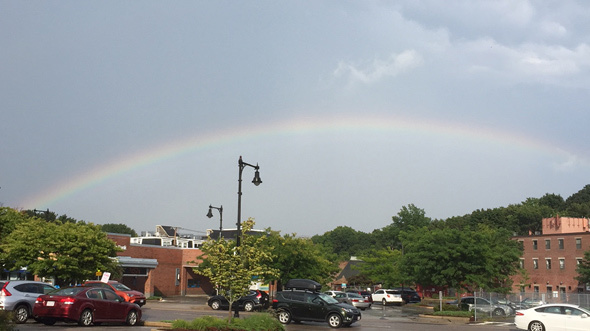 Roving UHub photographer Nancy Reynolds captured the rainbow over West Roxbury during the first storm that came through the area. Jake forwards Nikki Stewart's photo of Danny Road at Reynold Road in Readville following this morning's torrents. A backed up storm drain might have contributed to the new lake. 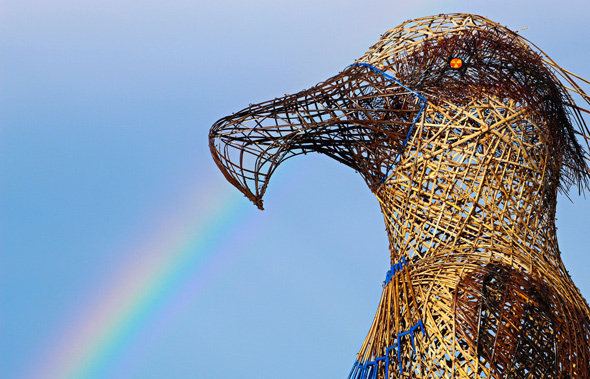 After the storm, Eileen Murphy walked out to the Sugar Bowl in South Boston (which currently features a bird statue). State officials were talking about the impending closing of the Comm. 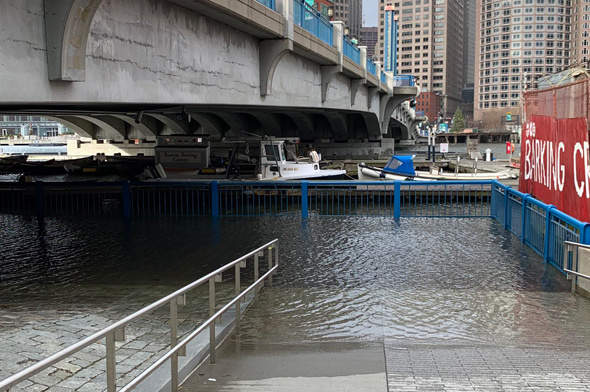 Ave. bridge, but their warning would apply equally to the storm Matthew Ferry watched roll in over Boston and Boston Harbor, from Thompson Island around 3:50 p.m. Read more. 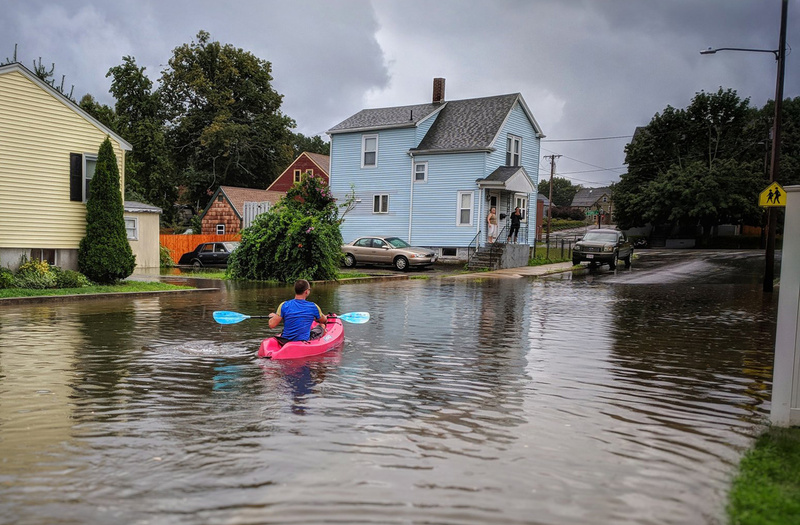 The National Weather Service is cautioning that tomorrow might not be the best beach day: A front moving in after midnight could bring rain and possibly worse, the NWS warns: Read more.